Fuel at thousands of locations nationwide, including the Comdata proprietary network, as well as at any location Mastercard® is accepted. Cover unexpected or routine maintenance needs with near universal acceptance on the Mastercard® network. Get immediate access to company advances. Enjoy the benefits of the industry’s most trusted payment method for scales and tire purchases. 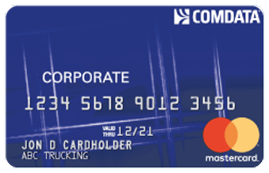 Whether you’re an owner/operator or have a small fleet of 20 trucks, with the Comdata Over-the-Road Mastercard®, you have access to preferred discounts at leading fuel merchants and thousands of independent locations through universal acceptance on both the Comdata and Mastercard networks nationwide. If you can benefit from discounts at the pump, maintenance and repairs or company-designated services such as IFTA tax administration, the Comdata Over-the-Road Mastercard® can help. We offer the tools and preferred solutions necessary to drive your business forward. The Comdata Over-The-Road Mastercard offers you more than just savings on fuel purchases. This versatile card allows you to control your driver’s expenses by setting limits, offer spending beyond fuel, and fraud protection to ensure you are maximizing your profit and growing your company. Improve control and reduce fuel costs through personalized spending controls to manage credit transactions and company-designated pump shut-off configuration. And by utilizing real-time insights, Comdata’s data analytics tool, FleetAdvance displays transactions that should be monitored and reimagines successful fuel transactions to drive more savings at the pump. The Comdata Over-the-Road Mastercard® is issued by Regions Bank, pursuant to a license by Mastercard® International Incorporated. Mastercard® is a registered trademark of Mastercard® International Incorporated. Comdata® is a registered trademark of Comdata Inc. ©2018 Comdata Corporation. All rights reserved.